This is the 2nd Limited-Edition 'Deluxe' variations McDonald's Korea has had in 2011. 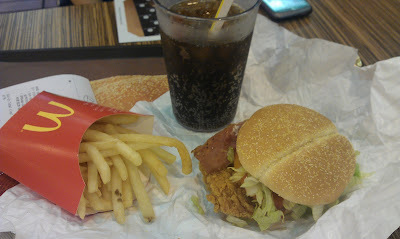 It is the standard McDonald's Korea 'Shanghai Spice Chicken', but the 'Deluxe-ing' is to add bacon, a special mayo. and a slightly bigger bun. The Deluxe edition costs 1,000-1,500W (depending on lunch or dinner) more than the standard. Price - 5,900KRW (~$5.50USD) - The promotion 4500W is only for lunch. Rating - 4/5. The standard Shanghai Spice already being a favourite of mine, I really enjoyed this Deluxe edition. I don't think bacon and a bigger bun are worth the 1,500W premium during lunch time, but the 1,000W premium during dinner prices make it worth a try. Have tried the original but not deluxe. My beautiful wife just went to get me one. Very good sandwich I am betting. Thanks for the post. I live just outside of Osan AB.